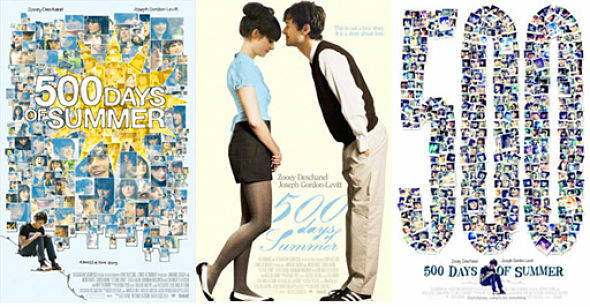 I have been dying to see this movie (500) Days of Summer ever since I saw the trailer for it during The Brothers Bloom (Another fantastic movie). Tom, played by Joseph Gordon-Levitt is a hopeless romantic & an aspiring architect who is working at a greeting card company. Summer, Zooey Deschanel, is a girl that starts working at Tom’s company but who doesn’t believe in true love, therefore doesn’t want to be held down by a relationship. The moment Tom sees her, he believes that he has finally found the one. Zooey, on the other hand, thinks he’s interesting. This is the story told from Tom’s point of view, where in 500 days, Tom learns about love & losing love, relationships & reconciliations. As most of us do, Tom remembers only the good moments and is bewildered when Summer tells him that they shouldn’t see each other anymore. The story is told in a non-linear fashion, where a moment after the break-up triggers a memory in the first two hundred days when things were good. Tom believes that even though Summer says she doesn’t believe in love, she just hasn’t found the right person and that in time, things will fall into place because she is the One for him. This movie is cute, funny, and heart-breaking because you know that the relationship is going to end…It’s just a matter of how and when…and whether or not Tom will be able to get Summer back after she tells him that they shouldn’t see each other anymore. 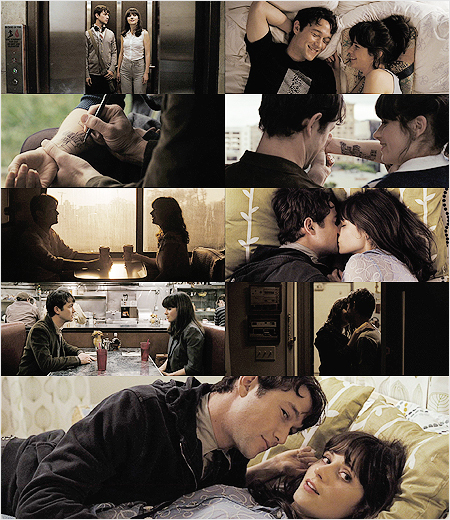 The symmetry of the movie will leave you feeling for Tom who lives in the expectations of the relationship and is finally faced with the reality of the past 500 days of Summer. The soundtrack is amazing, the aesthetic of the movie is fabulous and the chemistry between Zooey and Gordon is undeniable. I laughed, I was ready to cry but was rooting for both of them, even separately, by the end of the movie. This is a good movie to watch alone…or with your significant other. No matter who you see it with, it’s a movie that will stay with you for the rest of the year…and throughout your life because we all fall in love. .-= Taylor´s last blog ..A Fragment-y Friday =-. .-= phampants´s last blog ..A Little Bit of Awesomeness =-. .-= LiLu´s last blog ..Yes, a Whole Goddamn Post About the Hole in My Shirt =-. .-= Jaime´s last blog ..I LOVE…Fridays (and a little something extra!) =-.